Silvered/chromed white metal badge by Firmin, London. Circular, surmounted with Queen's crown. Lettering around the border 'Air Force Dept. Constabulary'. EIIR to centre. Slide fixing to rear. Maker marked. Excellent. From 1964, the Air Force Dept. Constabulary (formerly Air Ministry Constabulary) was responsible for policing airfields and aerodromes for the RAF. 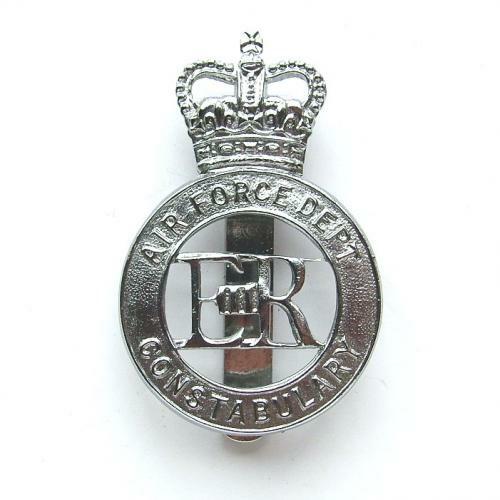 The AFDC was absorbed by the Military of Defence Police in 1971 so this badge was used for a relatively short period. Stock code NIV-AMC.